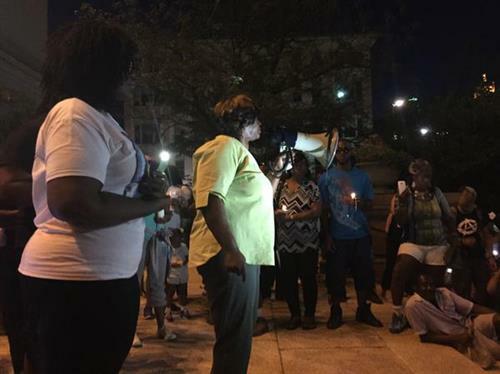 Black Lives Matter Cincinnati held a "Light Up the Night for Samuel DuBose" rally Downtown at the Hamilton County Courthouse, a day after former University of Cincinnati police officer Ray Tensing posted bond and was released from jail. 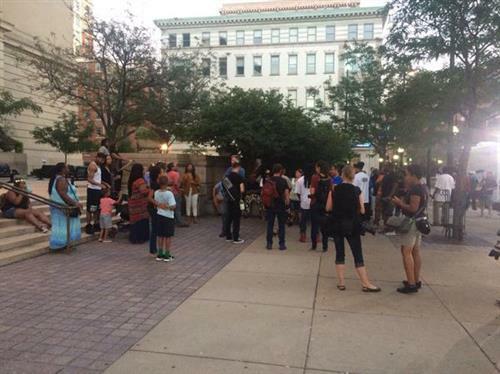 A few dozen people so far at the Hamilton County Courthouse or the "Light Up the Night for Samuel DuBose" rally. Speakers to start soon. People say they're upset Tensing was allowed to bond out of jail and that the other 2 officers weren't charged. Organizers say they're there to lift up Sam, keep up pressure through peaceful demonstration. Protesters are holding hands in prayer on courthouse steps. "Lord, we are all created in your image." 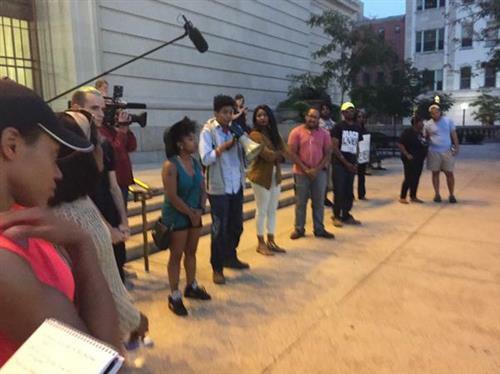 Man who led prayer quotes Dr. Cornel West: "Justice is what love looks like in public." Main message from speakers tonight is love, that black lives matter, that every life matters. 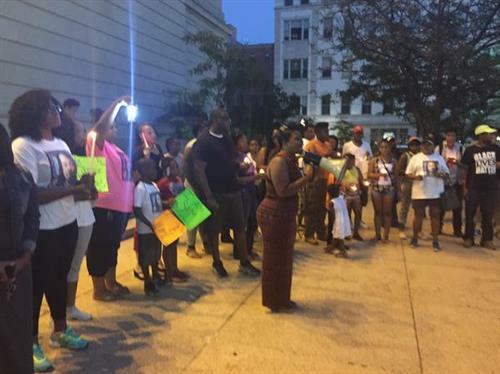 Now lighting candles on courthouse steps, to "Light Up the Night for Samuel DuBose." "This just shows that it's not all bad. This just shows that there's still love ... This shows that all lives matter," DuBose's cousin says. Speaker says they're there for justice for people killed by police, and for "babies... like the girl last night," talking about Avondale. Mother of homicide victim: "Pass the message on, put down your guns, stop killing each other." Rev. Peterson Mingo now leading prayer. "If we put all our little lights together, we can brighten this whole city, this whole country." Rev. Mingo leads crowd in singing "This Little Light of Mine"
Speaker talks about police shootings: "I'm angry. We can't take this anymore." "If you're black, you're under attack, and that's a fact," she says. Sam's mother, Audrey DuBose, says she has faith God will serve justice. Audrey DuBose quoting Psalm 90. "Lord, thou has been our dwelling place..."
"We've got to continue to stand tall, because we walk with God," Audrey DuBose tells crowd. Crowd chanting "I believe that we will win." "You did this to a child of the kingdom," Audrey DuBose says of her son's killing. Crowd raises their candles, reciting the Lord's Prayer. Sam's mother, Audrey DuBose, leading a march from the courthouse. As they walk, they're chanting "I am Sam DuBose!" Police blocking streets for @blacklivescincy protesters as they march up Main Street in Over-the-Rhine, chanting "I am Sam DuBose." DuBose's family said they were overwhelmed by the show of support for #SamDuBose . Some people coming out of OTR's bars and restaurants to watch, some to cheer on protesters.